The folks at R-Go Tools REALLY put thought into ergonomics. We reviewed one of their ergonomic mouse models a few months back. We’ve seen just about every single iteration of the ergonomic mouse there is…and then the R-Go Tools engineers show us something different. They created a mouse with Anti RSI software that helps track healthy break times embedded right into the mouse! 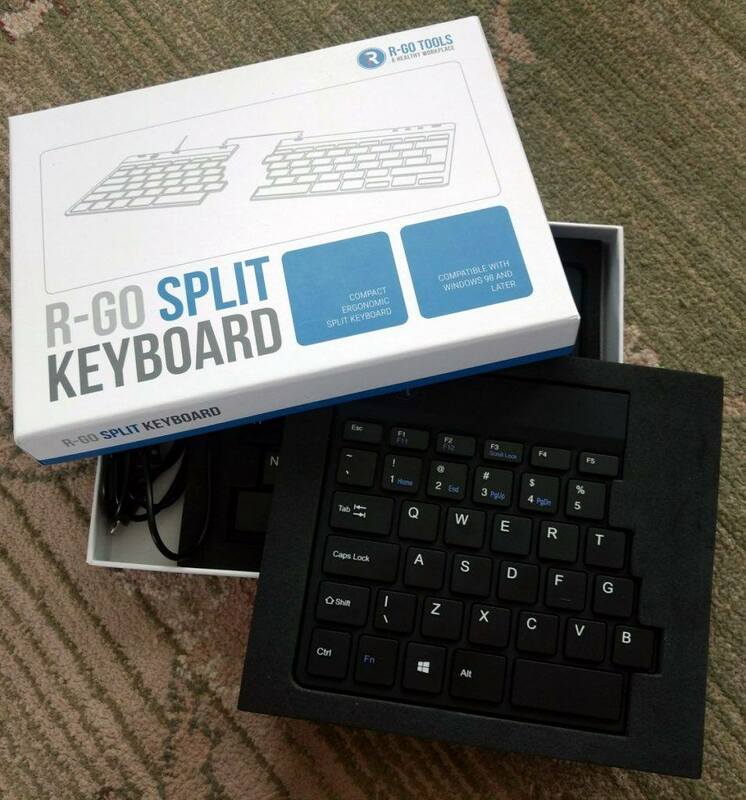 This keyboard is no different as it seems the R-Go Tools engineers also used a bit of creativity to create this ergonomic portable keyboard. 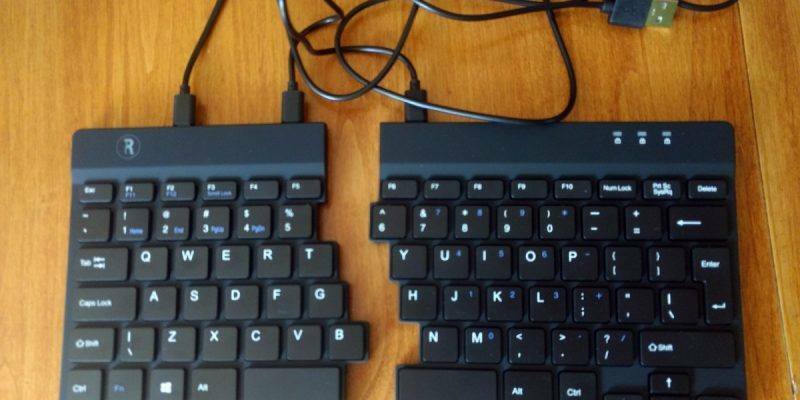 A portable, compact split keyboard? Yes, it sure is. The most striking feature of this keyboard is the size. I only use split keyboards. Non-split keyboards just don’t have the correct ergonomic angles I need for a healthier typing position. This split keyboard is one of the most compact split keyboards I’ve ever tested. You can see just how portable this keyboard is below. Tip: Save the keyboard box. You can use it to pack and transport this keyboard safely in your computer bag. Save the box. The keyboard stores securely into a size that fits in most laptop bags. Despite being portable, this is a full-sized keyboard. In fact, stacked up against my MacBook Pro 15″ keyboard, this keyboard is slightly wider. 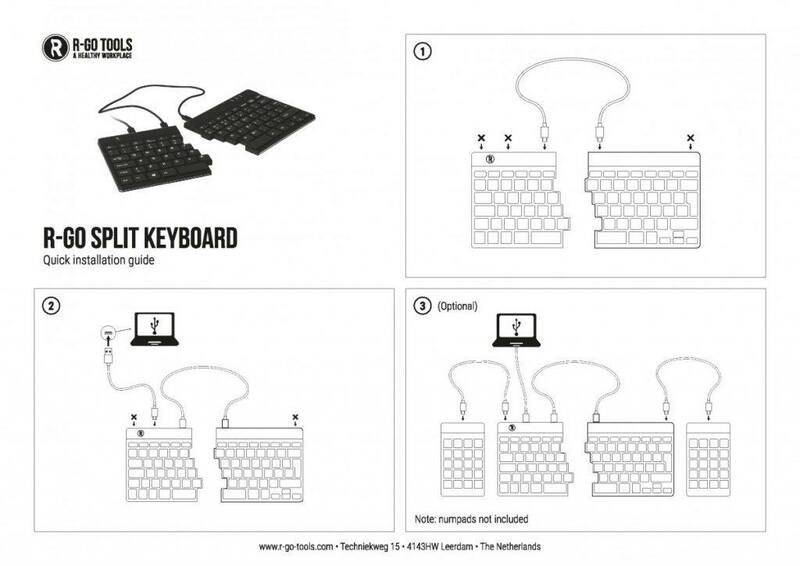 The keyboard comes with the following instruction sheet. Instructions are simple to follow. I plugged the left side to the right side with an included Micro USB cord, then connected the left side to my computer with the included USB cord. I didn’t follow step 3 that outlines an optional number pad that can connect to either the left, right, or both sides. The number pads are not yet listed for sale on their website, so I am assuming this accessory is coming soon. I got the U.S. QWERTY version of this keyboard, made for Windows computers. There are also AZERTY models, and models customized for the French, German, U.K., Belgium, and Nordic markets. While there is no Mac version, the keyboard works fine on my Macbook Pro. You may need to get a key mapper if you want to use special keys like the Function keys on a Mac. Otherwise, for typing, it works fine on my Mac, Chromebook, and Linux machines. You can connect both sides together and embedded magnets will snap the pieces together. This would give you the typing experience of a good laptop keyboard. Or, you can split the keyboard apart and separate and angle the keyboard to best match your preferred and most comfortable typing position. I tried a bunch of different angles and decided that the most comfortable position is about 2.5″ apart. 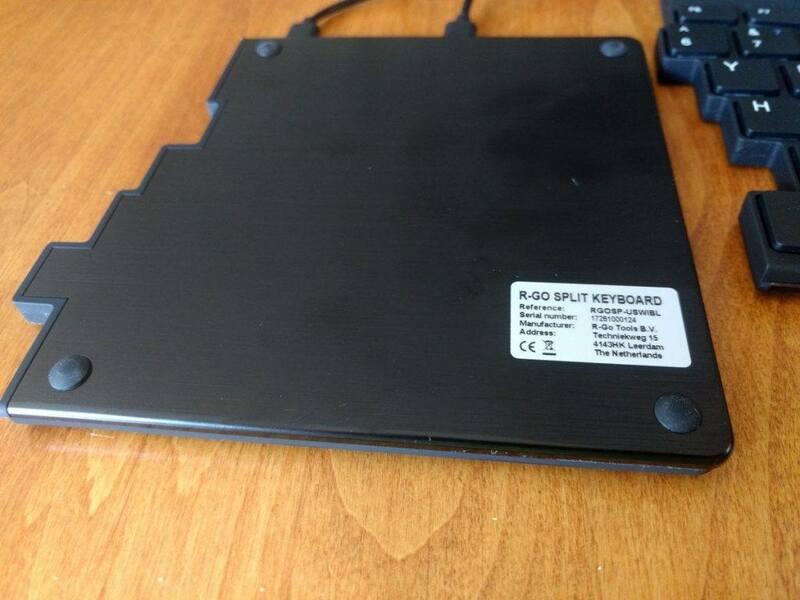 The bottom of the keyboard does not have any configuration options such as legs that let you raise one side. I wish it did though with the thinness of the design, it would be harder to create something stable at odd angles. 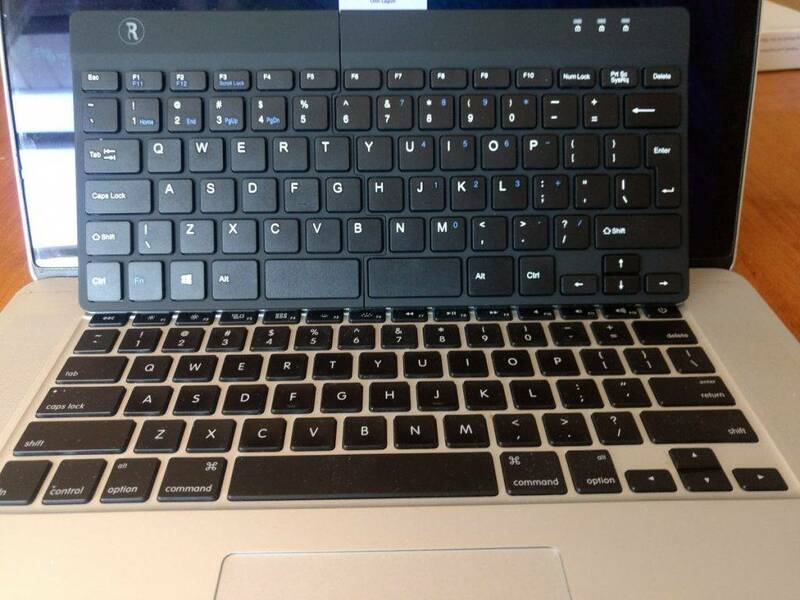 The only option for this keyboard is to lay it flat and decide where you want to position the left and right sides. Although this is not a mechanical keyboard, the keys make a satisfying click when you press them down. The keyboard is only 550 grams (this is light!) and the keystrokes require a light touch, so typing on this will satisfy people who want an easy-to-type-on keyboard with some tactile feel. Typing on this keyboard reminds me of typing on MacBook Pros from a few years back. The keys don’t make a lot of noise when typing. My Kinesis is about twice as loud as typing on this keyboard. It did take me about a day to get used to the key placements. 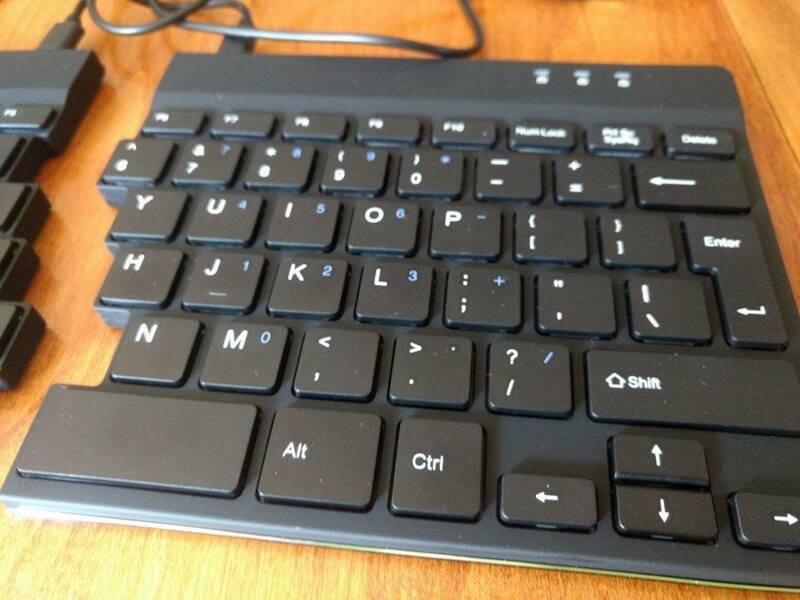 If the layout is different than your keyboard, you are going to need a few hours to adjust. The key I had the most trouble with was the left side shift key. It’s a bit smaller than I am used to. The right side has a normal size shift key. Once I had some typing under my belt, my typing speed returned to normal. The bottom is made out of a rubbery material that will grip your desk a little. During normal typing, the keyboard does not move around. Should you buy this keyboard? I love my Kinesis and Ergo Dox keyboards! But they don’t fit well in my laptop bag. This is the first compact portable split keyboard that fits. If you type on your laptop in many different places, this keyboard may give you a more ergonomic typing experience everywhere you go. It’s not too big to even whip this keyboard out while working at a coffee shop. Just be prepared to answer questions as I got a few when I used this at my local coffee house. I’m grateful for companies like R-Go Tools that try to approach ergonomic design with some creativity. Their mouse and this keyboard show bold design. This is the most compact split keyboard I have tested and when placed back into the retail box, it can safely travel with me in my laptop bag. It’s not the perfect ergonomic keyboard. I wish I could tent/angle the sides up. But it is much more comfortable and better than my built-in laptop keyboard. They say the best camera is the one you have with you. This may become the best ergonomic keyboard that I’ll have on me as I travel about. Well done R-Go Tools. Check out R-Go Tools’s offering of products for sale.